Allow me to further customize your jewelry design by adding a hand-stamped tiny monogram charm to your necklace or silver-toned bracelet at the clasp. Each piece is hand-stamped by me in a capital letter and can only be stamped on one side of the paw print charm. The stainless steel heart and oval tags will be stamped with one letter on both sides of the charm. These monogram charms are ONLY available as add-ons and cannot be purchased separately. 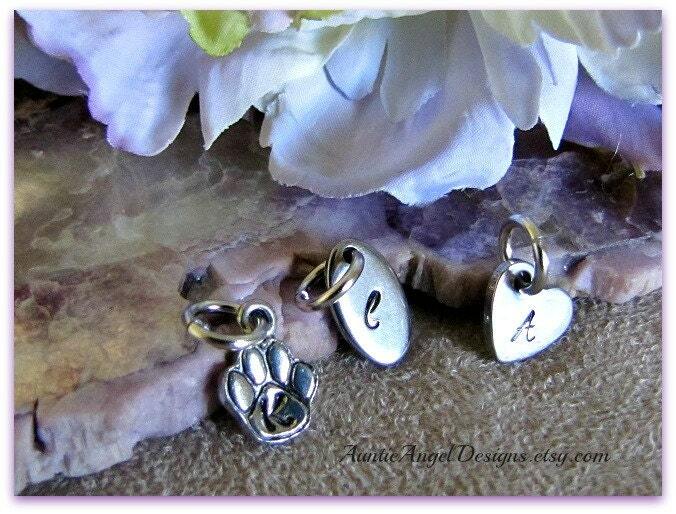 The paw print charm is made of pewter. The paw print design is on only one side of the charm. If this charm is being added to a toggle clasp, it will be attached with a split ring. If added to a necklace, it will be added to the chain with a jump ring. The letter stamp font is different than what I stamp stainless steel pieces. The font that is used is what appears in the photo and is not interchangeable with the other font. The heart tag and oval tag are made of stainless steel and will be attached to your necklace with a rhodium or stainless steel jump ring. The letter stamp font is specific to stainless steel and is different than what I use to stamp other metals. The font that is used is what appears in the photo and is not interchangeable with the other font. Note: The price noted is for ONE monogram charm. Please convo me if you have any questions before placing your order.